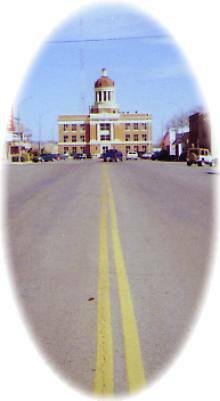 Historic Route 66 takes travelers through the town of Sayre, the county seat of Beckham County which boundaries the historic 100th meridian dividing Oklahoma and Texas. Visitors may recognize the Beckham County Courthouse from the movie, "The Grapes of Wrath." First time visitors may be surprised to see ostriches roaming the plains around Sayre. This town is home to some of the country's biggest ostrich farms. In fact, Sayre ostriches are shipped all across the U.S., Canada, and Mexico. Be sure to keep an eye out for the Ward's 66 Lounge building mural, Sayre Park with the WPA constructed rock swimming pool, the Art Deco Post Office with its 30s mural of the Land Run, the pedestrian tunnel under the highway, and the Owl Drug Store that has a 50s style soda fountain and giant murals. Especially good times to visit Sayre are in April for the Great Plains Carnival, in June for the Shortgrass Rodeo, in August for the Junior Rodeo, and in October for the Sayre All Wheels Car Meet. The Sayre City Park offers an abundance of activities all within a half-mile radius, such as a well maintained public nine-hole golf course with cart rentals available. The Shortgrass Country Museum is one of the important historical landmarks of Sayre. In 1930 the Rock Island Depot was moved from its original site to the center of downtown.